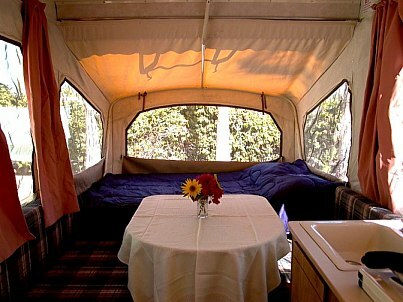 Sure, a Tent - Trailer can't be a hotel room and is not as perfect as a big motor home, but it beats living in a tent any day. The rig is so light, you can move it even without a vehicle and it can be towed with the smallest car. The RV is so roomy, you have plenty of space. 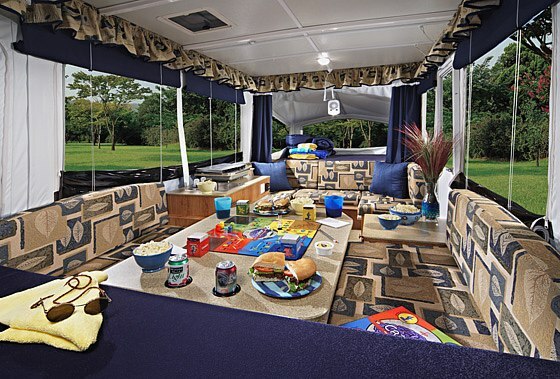 There is the living area which can be converted to a twin bed, the table is also set up for outside use and if you roll out the awning, you extend your living space considerably. There is a small kitchen with a 2 burner stove and a sink to do the dishes. 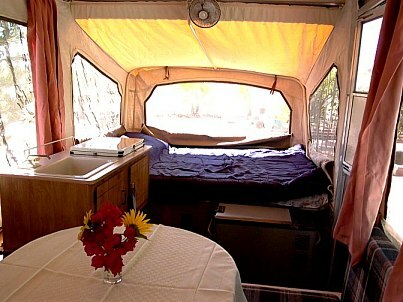 The overhangs on both sides are 2 spacious queen size beds and it sleeps 2 on each side very comfortably. With the converting of the dinette place, there is room for a total of 6 to snore. There are also 110V outlets and a converter to use the 12 V set up. 1 big propane cylinder in front contains plenty of gas to use. Since the Tent - Trailer can be towed with the smallest car, you only need a trailer hitch with a 2" ball. If you don't have a car, we can give you different models to go around. Our most favorite is a VW Vanagon van which holds all your stuff, has 7 seats and you can load the whole family. Sure, now you would like to know how much everything cost. We have different Tent - Trailers. The model you see here is our most economical RV and will rent for only $ 250 Dollar + tx for the whole week. This is much lower than a decent hotel room. It can be towed even with a very small economical car without any problem. 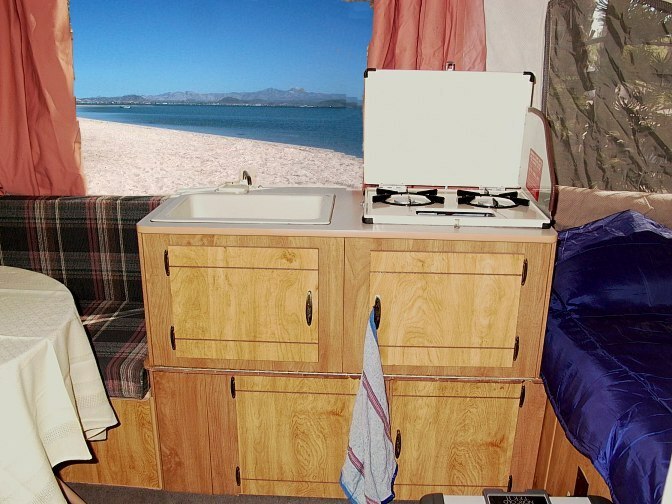 In case you don't want to drive, we also can pull the RV to a beach or any other place you like and set it up for you. 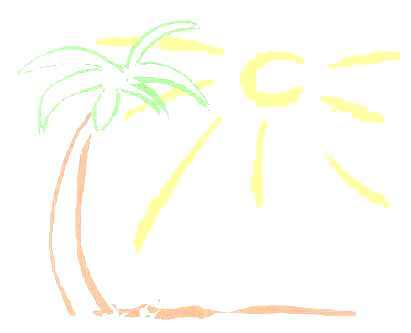 There are gorgeous places you don't want to leave and being in your RV right at the beach is a wonderful vacation. To get more information, just send us an e-mail. Keep in mind, that we are booked way in advance, so please reserve in time. ACCOMMODATION PLUS ..... S.A. de C.V. 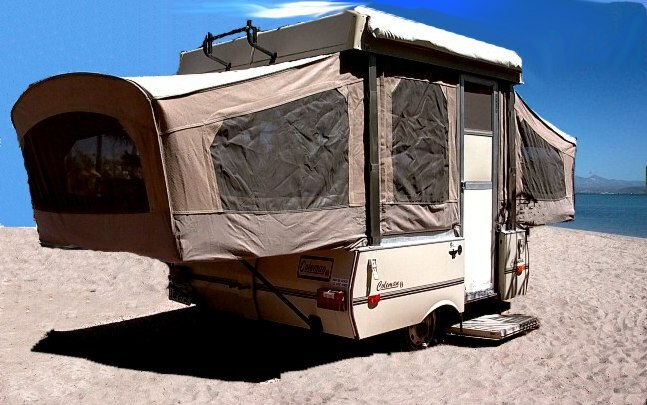 If you have already a rig and are looking for a place in the sun, here is a setup for permanent RV's. 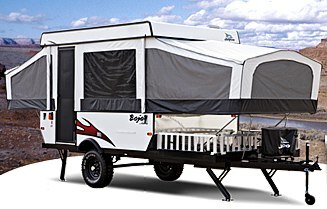 If you like more comfort and a Tent Trailer with really everything, from a kitchen with fridge and a bath room with toilet and shower, here is the one !! Since there is more weight, you need a medium size car to tow. This model is affordable with only $ 490 Dollar + tx for the whole week . Here is the RV for the off - road fan. The Baja Tent Trailer is designed to take a 4 runner or 3 off road bikes along. There are still all the amenities and comfort on a slightly smaller space, but you have your "toys" with you. The high clearance allowes you to take the rig on rough roads and open up new beaches and desert places, usually not accessible for a standard RV. The weekly rent is $ 490 Dollar + tx. Please reserve way in advance! !